Deep-fry a few chicken wings, sauté a steak, or pop a casserole in the oven with this nonstick jumbo fryer from Calphalon. The fryer is deep enough to hold hot oil and even certain stews and sauces. 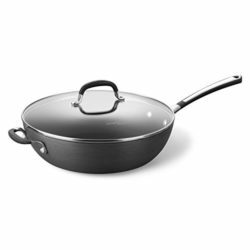 In addition, the shorter-than-usual handle allows the chef to slip the pan into a normal-size oven without hassle. The deep skillet also includes a tight-fitting brushed stainless lid that keeps ingredients moist during braising or frying, giving finished wings and breasts a tender interior and a crisp, brown exterior. This entry was posted in Calphalon and tagged Calphalon, Deep, Jumbo, Nonstick, Simply on August 19, 2017 by admin. Great Calphalon Pot! Love this pot! I love the heat-resistant handle and that I can see through the lid. The shape is nice..no corners for stuff to get stuck in. The non stick finish is wonderful, and cleans up well. And the extra handle on the opposite side is super convenient. Deeper pan to replace our current Simply Calphalon pan. Very Happy. We were already using a Simply Calphalon omelette pan for general purpose cooking, but my wife found it too shallow for big recipes. The old pan was holding up well after about a year of use. This deeper pan (3″ plus) works great. No more stir fry ingredients escaping.